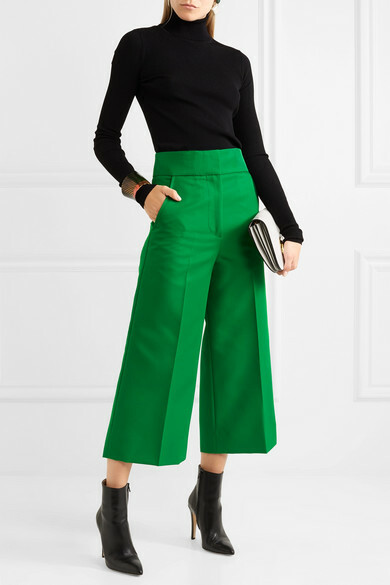 Cropped wide-leg pants are showing up in stores fairly frequently these days. For years now, we have been wearing skinny jeans, leggings and narrow-legged pants. At first, I felt out of my element in tight-fitting bottoms. As much as I love skinny jeans now, it can be hard to get used to a new silhouette. While you may be willing to give the wide-legged, cropped styles a go, it can be difficult to transition to such a different shape. What do you already have in your closet that you can wear wider and cropped pants with? If you are petite, how do pull off a style that has the potential to make you look shorter? Will a cropped length make you look like you out-grew your pants? 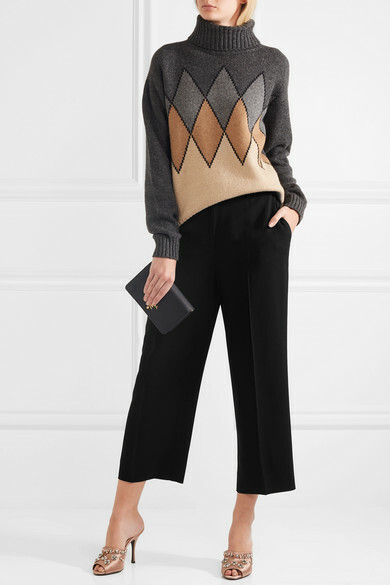 What shape of shoe will make the cropped wide-leg pants most wearable? 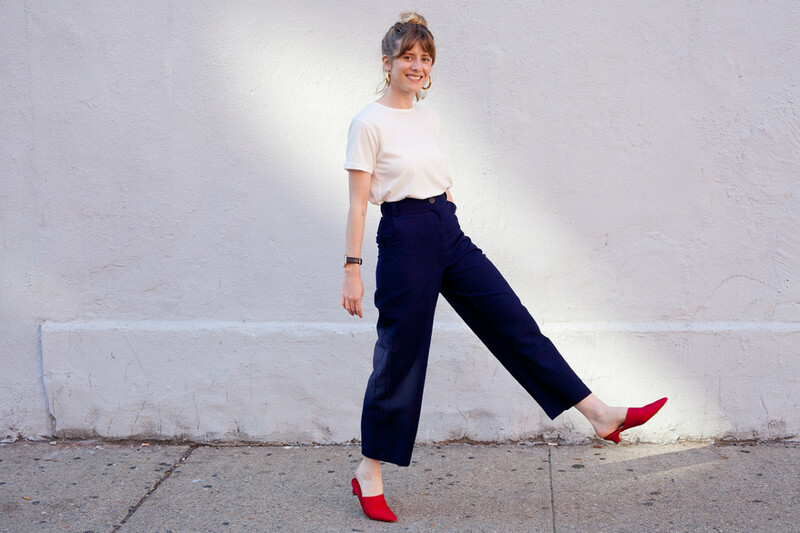 The key to making a cropped wide-leg work when you’re petite is all about where the pants stop and what’s on your feet. If the pants are too long, they will overwhelm you, and if they are too short, they will make your legs look shorter. The intent is that your pants look as long as possible. Consequently, cropped pants that are a little higher on the waist are even better. Try a tucked in shirt or a shorter top that won’t cover up the top of the pants. Shoes with a higher or stacked heel help to give you extra height. Similarly, shoes in a similar colour to your skin help keep you from looking chopped in half. Show leg skin between the pants and shoe to keep legs looking long. Also, slides or mules that show the complete back of your foot, especially if heeled, will work to lengthen your leg line. 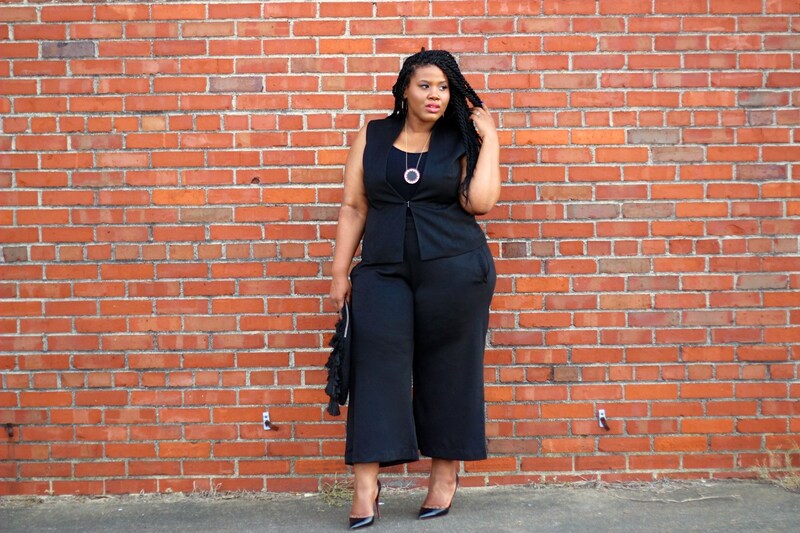 Make a conscious decision about what length you want your wide-leg crops to be. Ensure the length looks intentional, not just hanging a little bit above your shoe. If it looks purposeful, it’s less likely to look like you outgrew your pants. Also, wear a fitted top or one that the hem ends above your hips. An oversized top can look like you are wearing your older brother’s clothes along with your outgrown pants. This is probably not how you want to represent yourself. 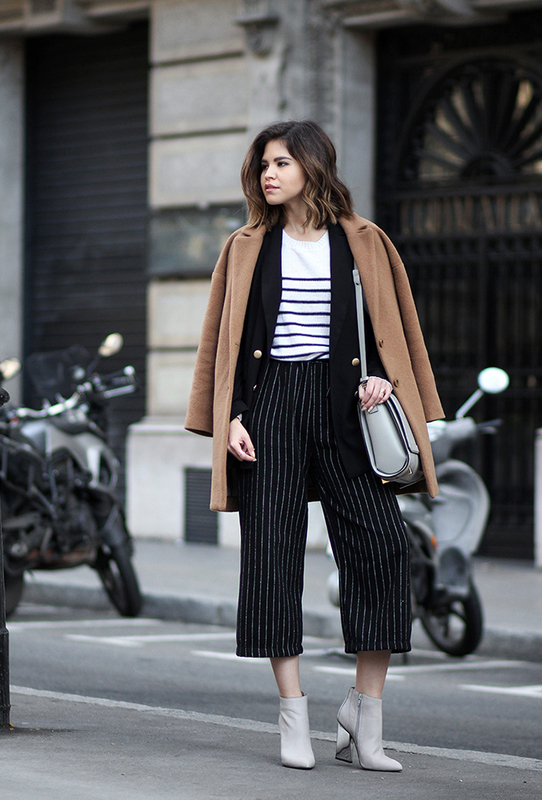 Show skin between your cropped wide-leg pants and your ankle boots. Wear heeled boots that are tight around the ankle and end high under the cropped pants. Choose flats but make sure yours have an open back like a mule or a slide. Again, these tactics maintain the slimming, and hence, elongating look of your leg underneath the wide pants. Streamline your silhouette by wearing all one colour, as suggested by Kim Postell of thenaturalfashionista.com. I’m sure you know, it doesn’t have to be black. Burgundy, cream, khaki and navy are also good options. Aim to emphasize your waist. This helps to balance the emphasis on the lower leg. And wear shoes with height to further elongate your body. Choose stacked heels over spindly stilettos to counter the potentially shortening effect of the cropped wide-leg pants. The best way to style yourself is to ensure, most of all, that we feel good in what we put on. Specific cuts of clothing may follow all the styling “rules” and be deemed “most complimentary” to your shape. But if you don’t love how you look in something, then don’t wear it. Blogger Tanesha Awasthi, while discussing culottes, poignantly wrote, “While I’m all for wearing what you love and not just focusing on what’s flattering, it’s also important to feel good in what you’re wearing”. Wide-leg crops paired with wide tops can look frumpy. Semi-tuck, half-tuck or completely tuck your top as this helps to build a defined waist. Roll or push up the sleeves to help highlight your waist. 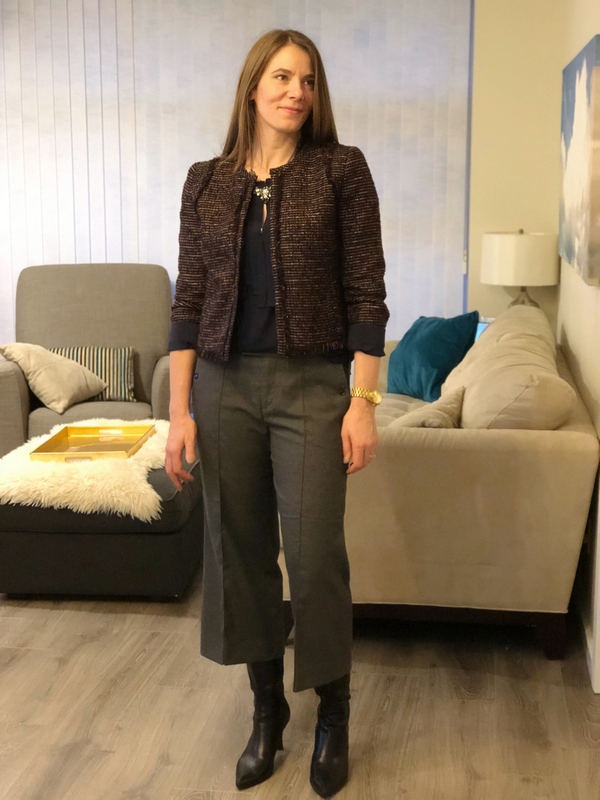 Wear a cropped jacket over a tucked top to keep your frame from being overwhelmed. Avoid wearing tights with cropped pants. The wider the legs of your pants are, the shorter you will look. Expressing yourself through style can be an enjoyable pursuit. Have fun with fashion. It may even bring you a little extra Joy of Style. Show us some groupie love on Facebook, Twitter, Instagram, and Pinterest. These looks are so fun! I love the denim pants! I’ve never been a huge fan of the skinnies. I love this trend. I love how you showed the style in different pants. It shows how versatile the style is. I love this kind of trousers but I always find it difficult to find proper shoes to match.